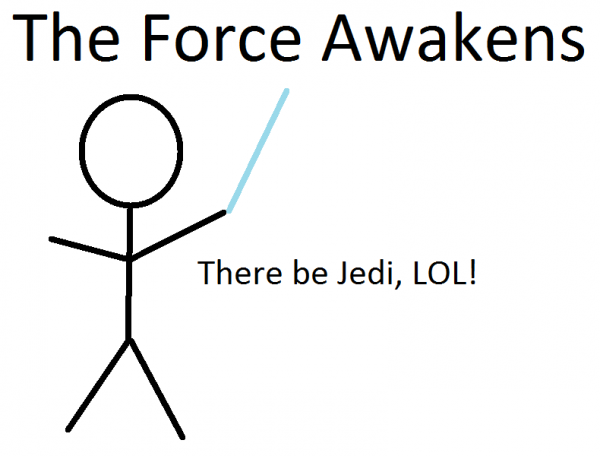 I won’t be seeing The Force Awakens anywhere near opening day. It’s one thing for me to stand in line and squish into a theater full of yelling loonies at all hours of the night. It’s quite another to take Little Jedi into that chaos. So it will be a good week later. I’m fine with waiting, because I’m patient like that, but I do not want to have some asshat spoil it for me. I’ve been avoiding all the teasers and stuff that have come out lately because… dudes, you don’t need to convince me to see the movie. I’m totally seeing it. Period. This could be the advertising campaign, and I’d still see it. No twitter, no reading my feed reader. I would say no facebook, but I ignore facebook always. So help me, I will turn off guild chat and log out of teamspeak if necessary. I’m pretty much resigned to having it spoiled. I should remember to turn off General Chat, though. Though it would be pretty funny if Bioware started handing out bans and suspensions for people giving spoilers in General Chat. I won’t see it for at least a few days either. We’ll see whether I can remain unspoiled. I have no idea when I’ll get around to seeing it. Certainly not until after Christmas, perhaps not until New Years’. I have to confess that I never bothered to see Episodes II and III. I’m just old enough to have seen A New Hope in its original run in the theaters, and it is hands down my favorite movie of all time. I loved The Empire Strikes Back, and am still somewhat conflicted over Return of the Jedi. Episode I was such a cinematic mess to me, that I just couldnt be bothered to set aside the time for II and III. From what little I’ve seen of those two movies on cable tv over the years, I’ve seen nothing to make me re-consider, and I’m NOT one of those trolls who insist that the prequels are abominations and anyone who says otherwise should be burnt at the stake. 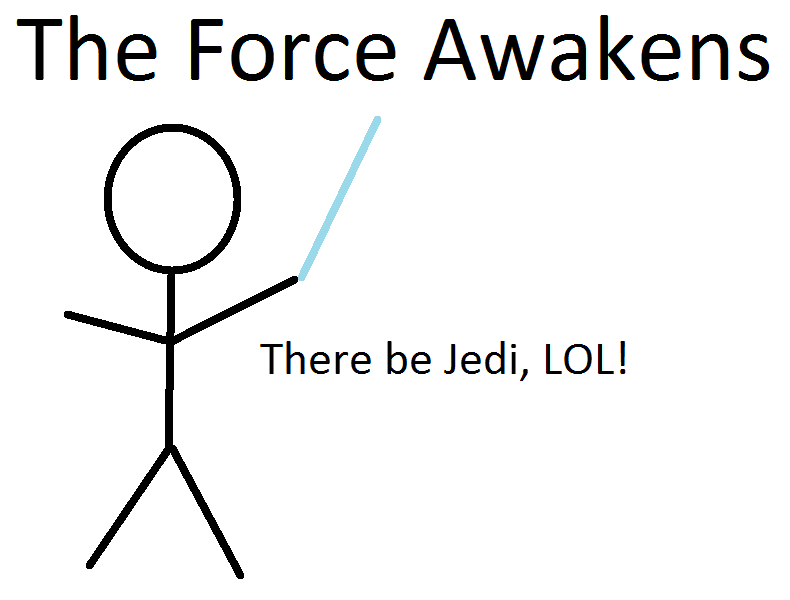 So, I’m hopeful that I’ll be able to enjoy The Force Awakens for what it is, I’m definitely going to give it a shot. It doesnt have to be the greatest Star Wars movie ever. It just has to entertain me. I *think* it will. I’m not too terribly concerned about being exposed to spoilers. It is not going to ruin the movie for me if I have an idea of what happens ahead of time. The plot line is either going to work, or it is not. It will either hang together or it will collapse from its own weight. Anyway, I wish all success to J.J. Abrams and crew, may they entertain us for many years to come. Go to an early morning showing in a non-3d, non-RPX/IMAX theater. Problem solved. I saw the movie and thought it was okay. I don’t much care for the prequels (pretty much hate them actually) but I did feel like the prequels built a far more interesting world for the EU to play around in (Clone Wars TV series anyone?). So far the world The Force Awakens built doesn’t interest me much, even if the movie itself was lightyears ahead of the prequels. Same for me. RL stuff going on; I haven’t even bothered to get tickets. I’m not reading any blog reviews, even if they say “no spoilers”. The reactions of people you read a lot of can even spoil you in a way (if you know them a bit and have the feeling you may react the same way, for instance). Sunday is the big day! 3 generations together seeing the big movie.